I started with some circle cork pieces, a few stencils and some acrylic paint. 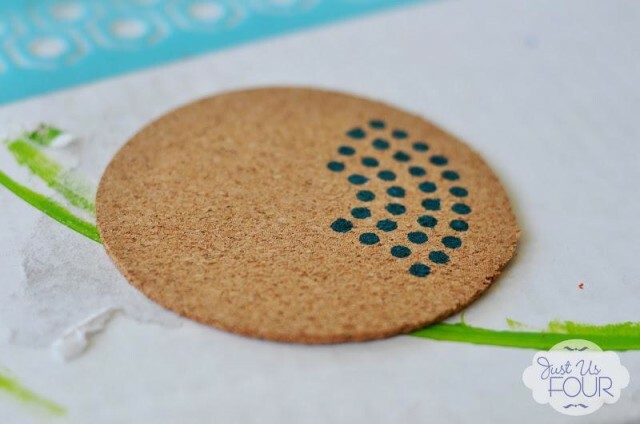 You can find the cork circles at the craft store or, sometimes, in the gardening section of places like Home Depot and Lowes. For the stenciling, I used a little foam stamper and pounced the paint onto the coasters. Just be sure to have a paper towel handy to off load the extra paint on the foam stamper before you start stenciling. I wanted my coasters to look like a set but not all be exactly the same. So, I did a few different colors and stencils to make a set of different coasters that coordinated together. 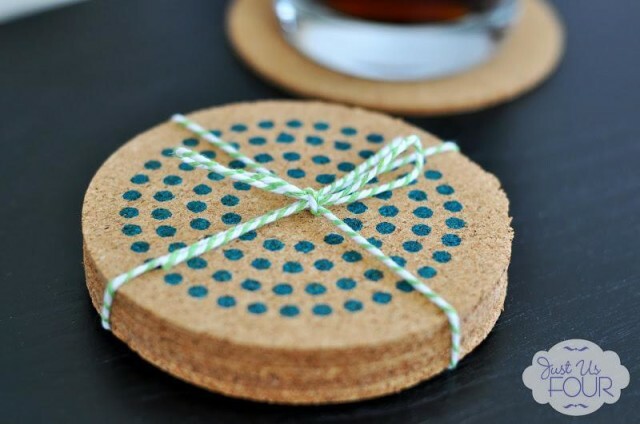 Tie the coasters up with some twine and you’ve got an awesome housewarming gift. You could even make a bunch of these sets ahead of time and just store them for when you need a last minute hostess gift or want to add a little homemade touch to a bridal shower present. Have you been making any new coasters recently? Do you prefer a stone coaster or something like cork? What do you normally give for housewarming gifts? Definitely scoop up those cork coasters. There are so many options! I like the idea of cork coasters much better than stone. These really turned out pretty! I love the cork coasters too. The stone ones are great but I love the cork ones. I love these — cork is so practical, and they are adorable. You could make a variety of these (monogrammed, holiday, etc.) and keep them on hand for hostess gifts as well! Changing up the stencil/decoration on the coasters is such a great idea! I love it. Such an easy and creative housewarming gift. Thank you so much for the instructions and for sharing your idea! Thanks! I was definitely thinking of them as a housewarming gift or bridal shower gift along with some glasses when I made them. Pinned it! How in the world did you keep your lines/circles so perfect?? I wish I could keep my hands that steady! Haha…I wish my hands were as steady as these coasters make it seem. Painters tape was definitely a friend for this project. Where did you get the circle cork? Details please! I got those from Home Depot in the gardening department. I know Michaels carries them too though. These are adorably cute!! I’ve been busy making things to sell in a booth at a local festival in October and sets of these would be perfect. I need to put this on my “to do” list. I’m pinning and will share your cute project on my Facebook page today. Love these! I’m always looking for unique gifts that don’t cost an arm and a leg! Christine Luken recently posted…Meal Planning Monday ~ Bring on the Pumkin Farms! Me too! Unique gifts can be so difficult to come by and, then, when you find them, cost so much. These are fun because you can really customize them to the person you are giving them to. I love this idea! We actually made out own wooden coasters this weekend! Oh, wooden coasters sound awesome too! I may have to add those to my list of things to try. Those look so awesome, I love how creative they are! I want to make these for holiday gifts, thanks so much for sharing! These would be perfect for holiday gifts. I can even see them being great teacher gifts too. What an adorable idea! I am not that crafty – but this looks so easy – and still fancy enough to give as a gift. Very cute! Love how you can customize them to fit your decor! That is one of the things I loved too. They are so easy to customize and there are hundreds of options. This is incredibly creative and crafty! I can’t wait to browse through your other DIY projects! these are really really darling- what a fun and creative gift idea! Thanks! I love how they turned out. Though I love stone coasters, because they are so sturdy and pretty, I prefer cork ones because they tend to actually not produce such a wet mess. 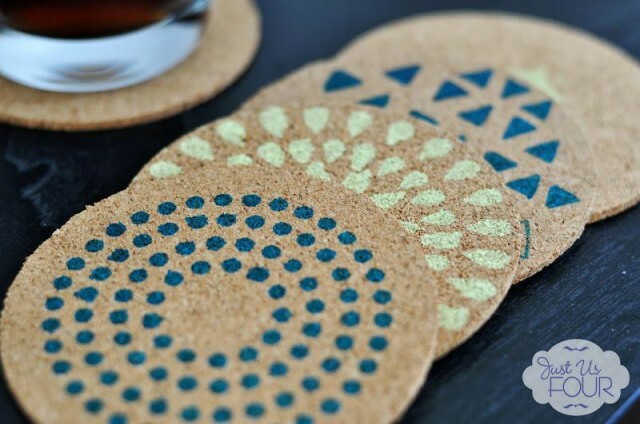 This is a great idea, I am actually helping with throwing a housewarming party in a couple weeks, so I may just have to go pick up a bunch of these cork coasters and make a few sets! Cindi Thornton recently posted…My secret obsession….my mailbox full of #freebies! I also prefer the cork because I know they are safe for the kids to use without worrying about breaking/chipping! So simple but looks so pretty! I love crafty ideas that make wonderful, thoughtful gifts. Thanks! I think handmade gifts are really special because of the thoughtfulness that is behind them. These would be a great gift, but I also want to make some just for my apartment! 🙂 I love DIY projects because they are so original; no one else will have the same one you come up with when you make it yourself. That is one of the exact reasons I love making stuff like this for myself. I know I won’t see it exactly the same in anyone else’s home. Thanks! I think they would be such a cute gift…especially with a set of glasses. This is such a thoughtful gift. I really, really like these! Thanks! I thought they would make a fun gift. These look adorable! What a great gift idea! Thanks! I think they turned out really well. Plus, they are just so easy to make and there are a million options on colors/styles. Oh, having kids make them as a gift is a great idea. THat would be awesome for Mother’s Day or a birthday. Charise recently posted…How Many Harmful Chemicals Do You Think Are in Your Child’s Classroom? Thanks! I am really happy with how they turned out…especially considering how easy they were to make. Wow – those are really nice!! You’re very creative! Thanks Joanne! I really wanted an alternative to all of the ceramic and stone coasters we have around the house. I prefer stone, but these are really cute and fun! Rhonda recently posted…-sp Kid-Friendly Tablet Accessories Giveaway Get a FREE eBook When You Enter! Stone coasters are great but I like to have something around I am not too worried about the kids using. These are perfect because they can’t accidentally break them or chip them. I love this idea for making something uniquely yours.. they are so cute and look really easy to make.. These are very cute! You’re so creative! Motherhood on the Rocks recently posted…Help me decide which Hallmark birthday card to give to my mom! Those are really cute, what a great idea! 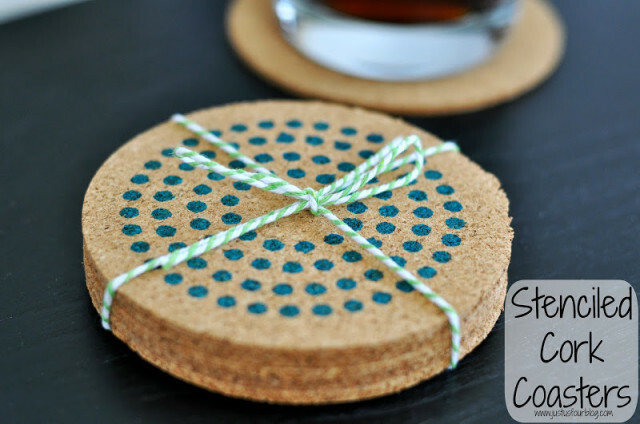 These coasters are soo cute and easy! I’m gonna have to make some just for me. Thanks for sharing! These are super cute! I’m pinning it right now! Thanks! They are very popular in our house! Such a cute idea. I’ve been trying to come up with good hostess gifts and never can seem to come up with anything creative but these would be great. Thanks Shannah! Hi Shannah! These are fantastic and what a great hostess gift for the season, too! Thanks so much for the awesome inspiration and pinning! Hope you are having a wonderful Monday! LOVE how simple this is! This would make great party favors or for gifts to keep on hand for birthdays. Thanks for the inspiration!